So any given Sunday, there’s a good chance you can find us at a nice brunch spot or having Sunday Dinner somewhere. This past Sunday, we were out and about and decided to stop at a restaurant we both enjoy – Grace’s, located on Upper Kirby in Houston. We’ve eaten there before, but realized we never blogged about it. But it’s worth it, so here ya go! If you’re familiar with the restaurant, you probably know that Grace’s is part of the Johnny Carrabba chain, and is located directly across the street from Carrabba’s on Kirby. Grace’s serves up good comfort food with an authentic hint of Italian and Creole. We were seated promptly and ordered an appetizer of sweet and sour calamari and shrimp (comes with Chinese broccoli and green tea soba noodles). This appetizer is definitely big enough to share, so we suggest getting it for the table. 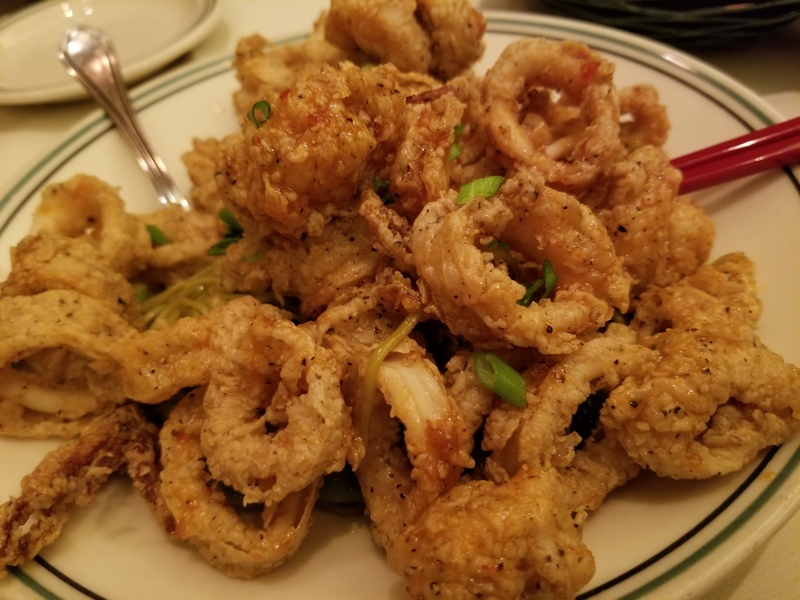 The calamari and shrimp are served fried and the sauce is a nice combo of sweet with a tiny kick. Now on to the entrees. And might we say our food was so prompt that we actually received our entrees before we finished our appetizer. But we’re not complaining – better prompt than slow! Val’s order: Creole Stuffed Chicken. 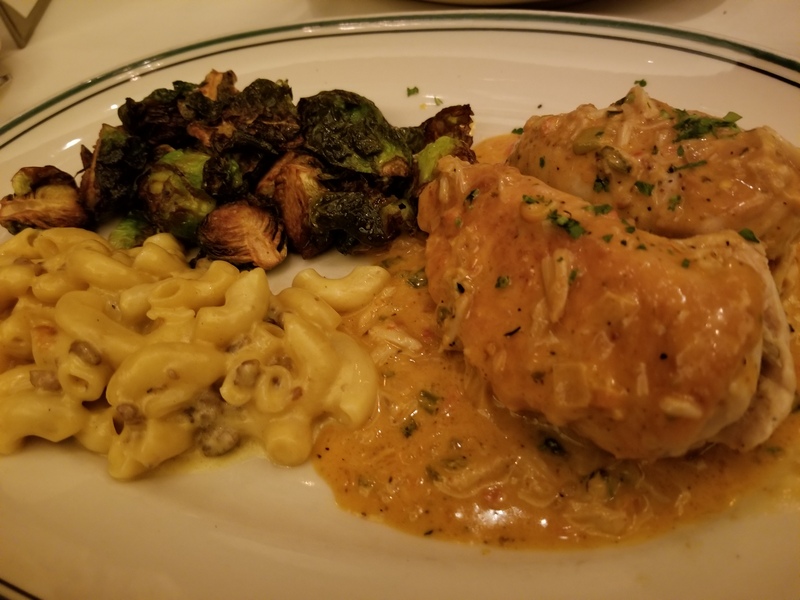 It comes with two chicken breasts stuffed with a Creole dressing and covered with a delicious lump crabmeat cream sauce. Now normally, I’m weary of chicken breasts because if not cooked properly, they can come out dry. But these were super tender and the sauce made it even better (clearly I’m a fan of sauce). I had the canal mac-and-cheese which included breakfast-style sausage and brussel sprouts. The mac-and-cheese was really good – not really dense or creamy, but that’s okay. The flavor was on point (not sure which kind of cheese it’s made with) and required no seasoning, which is a plus for me. The sausage didn’t overpower it, rather complemented it. Charred brussel sprouts are a favorite of mine, and though these weren’t the best I’ve had, they were pretty good. They are flavored with bacon, but note – there was no bacon pieces in the dish. Kim’s order: Braised Short Ribs. 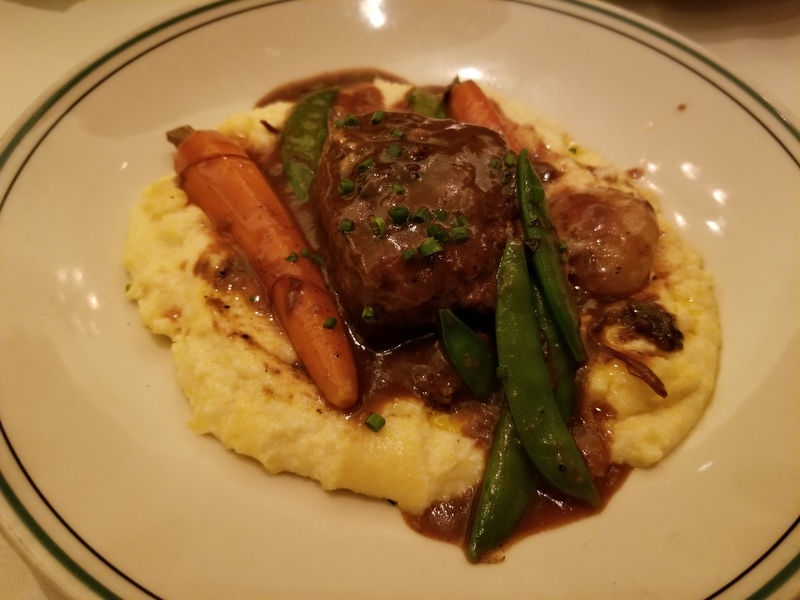 This boneless short rib is served over polenta with carrots, green beans and a pearl onion. I added some salt to the rib, but overall it tasted very good, definitely something I’d order again. The meat was so tender, I could literally cut it with just my fork. The polenta had a smooth texture and flavor reminiscent of mashed potatoes, but better! It was a heartier tasting side and an excellent complement to my short rib. Alas, we were too full for dessert, but Grace’s had a decent selection which included southern staples like bread pudding and apple pie. Oh and one more thing. Can we just say how much we appreciate a clean bathroom? 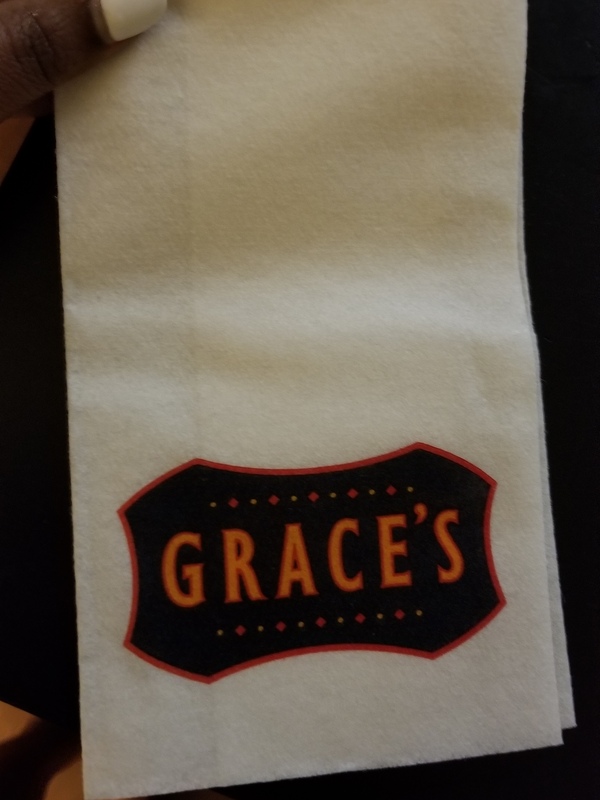 Grace’s women’s restroom was very clean and even had Yardley hand soap (if you know, then you know) and these lovely printed dry-off napkins. Grace’s is located at 3111 Kirby Drive, Houston, TX 77098. Grace’s looks like an excellent stop! I see it all the time on Kirby, but never knew what they were about. Thanks for sharing your review! I really want to try it! Awesome, let us know what you think of it! Thanks for the descriptive entrees and for including the pics. It’s definitely on my list. No problem! We’ve tried almost their entire menu and haven’t been disappointed yet. I celebrated my birthday at Graces this past Sunday, February 18, 2018. Everything was wonderful like always until the end. My Girlfriends and I were about to leave and were standing next to the table taking a picture. This rude customer out of no where came and rudly asked my party and I could we take pictures outside because she was waiting on a table to celebrate her daughter’s 34th birthday. My Girlfriends and I were so stun and could not believe that the woman had the nerve to do that. That really ruined my day. Why would she pick my party to do that? I love going to Graces and that shouldn’t have happened. Aw, that’s unfortunate. Hopefully that doesn’t keep you from visiting again. The food is so good!